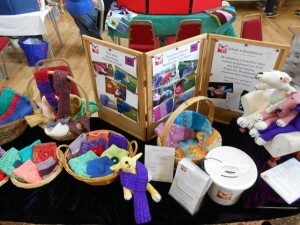 We had a great display of our sighthound merchandise and other hand made items which are beautifully crafted by our very talented, dedicated volunteers. With new ideas for the hand crafted items and the great demand for it all over the world, our stock is ever increasing, keeping the wonderful knitting and crafting ladies very busy. 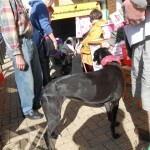 Our unique stall gained a lot of public interest throughout the day and many people took our campaign awareness leaflets. We also gained 2 more knitting volunteers. There were almost 50 stalls from crafting groups and the charities and good causes from across the county who benefit from the making and sales of the wonderful hand made items. A very busy day for our event, with beautiful Autumn weather bringing lots of customers to the store enabling us to raise awareness to even more people. Rosemary and her mum had a very successful stall at this annual indoor table top sale along with stalls from many other local charities and good causes. 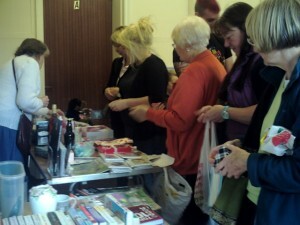 The tombola was very popular due to the many donations of prizes. Also a great opportunity to promote our campaign information, and sell Afg merchandise. 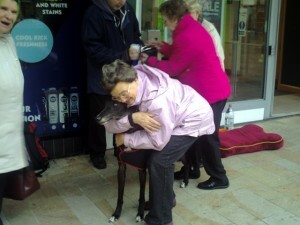 Dedicated Rosemary is out and about in and around Sheffield, constantly raising vital awareness of the plight of greyhounds, often out in all weathers and on nicer days, is accompanied by her beautiful adopted greyhound Sean, who has now gained a ‘fan club’ of his very own. Rosemary and her family and Sean are gradually gaining a great reputation around this area with the public who are very supportive of the Afg campaign. 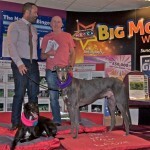 Another great idea for an awareness event, at a bingo hall where people are enjoying a good night out without being in support of animal cruelty and exploitation. 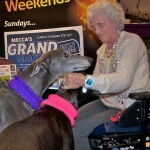 We were kept very busy during the two 15 minute breaks from the evenings bingo sessions. 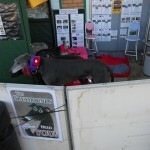 The hounds were able to accompany us this evening, being an indoor event. 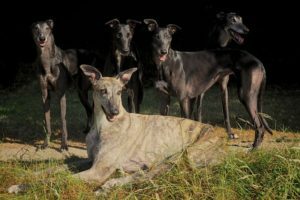 The management made us all very welcome and we were allocated a large area in the hall to enable us to put up a great display to promote the Afg campaign as well as having ample space for the hounds and their cozy beds. Of course beautiful Wilf and Zyri received constant attention from bingo players. 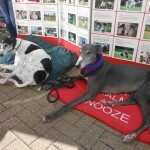 We sold several of our 2015 calendars and received many very generous donations. 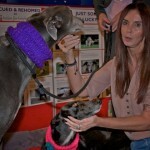 We had 2 very good articles including photos pre and post the event in our local Evening News paper.